Here at Bigbelly, we are driven to deliver smart solutions that solve the real-world challenges of public space waste management. We’re proud to empower our customers with data and analytics to enhance operations, while delivering a proven solution that keeps public spaces cleaner and greener for constituent enjoyment. Today we announce our third annual findings which summarize the global impact across communities using Bigbelly - all thanks to the robust waste management data captured in our CLEAN management software. In 2018, Bigbelly connected systems worldwide captured, contained, and collected 144,112,133 gallons (545,523,766 liters) of waste in public spaces. Last year across all connected Bigbelly smart waste and recycling systems, there were 3,166,814 collections made, 5,057,879 compaction cycles run, and 22,813,082 IoT messages sent between the stations on the street and the cloud-based CLEAN software platform. We are helping cities and campuses make smarter decisions about collection routines while offering more volume across a waste fleet thanks to notifications and patented solar-powered waste compactor technology. Bigbelly units are equipped with sensor technology that enables both HC (High Capacity) and SC (Standard Capacity) models to deliver data related to disposed contents. These units’ smarts are working right inside the station to measure and report waste volumes. All units communicate their status over a cellular network into the cloud-based CLEAN management software where station status is displayed in-sync with the units on the street. Customers select their desired pick-up threshold - typically it is 60% or 80% full - and receive notifications in their preferred method when it’s time to collect. 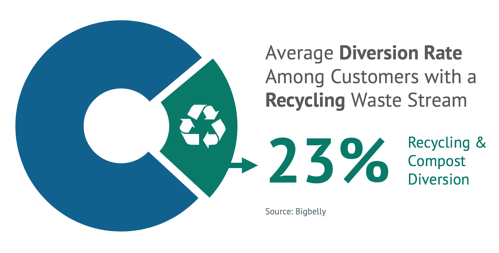 Over half of Bigbelly customer deployments have multiple waste streams, meaning that many customers around the world take advantage of our modular solution to make recycling available on-the-go, at every point of disposal. 22,520,056 gallons (85,247,685 liters) were diverted from landfills throughout 2018 thanks to pedestrians' proper disposal in Bigbelly units dedicated to recycling and organics/compost waste streams. 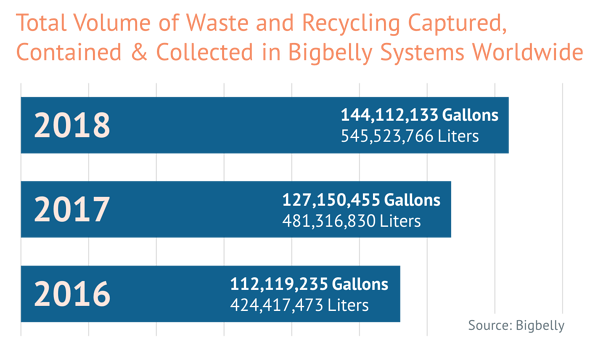 All Bigbelly systems in 2018 cumulatively captured and diverted over one million more gallons of recycling and compost than last year (2017). The average diversion rate of customers with at least one recycling waste stream was 23% and with at least one compost waste stream was 48%. The Bigbelly system measures volumes by waste stream and reports this by station location and the fleet overall. 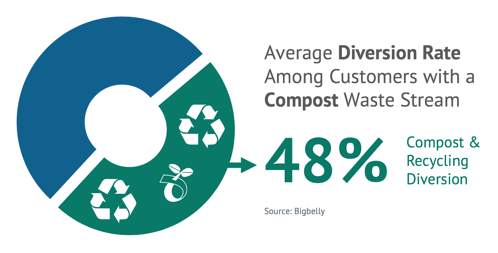 Many customers turn to Bigbelly to implement a measurable recycling program that can report recycling and compost diversion rate. Moreover, these customers are able to educate pedestrians on how to properly dispose of their recyclable waste while enjoying public spaces. Most customers experience a significant decrease in cross-contamination with Bigbelly compared to traditional open top bins for trash and recycling. Distinct iconography and options for customized graphics that detail exactly what can go in each bin make it easy for passerbys to properly dispose recycling in public spaces. 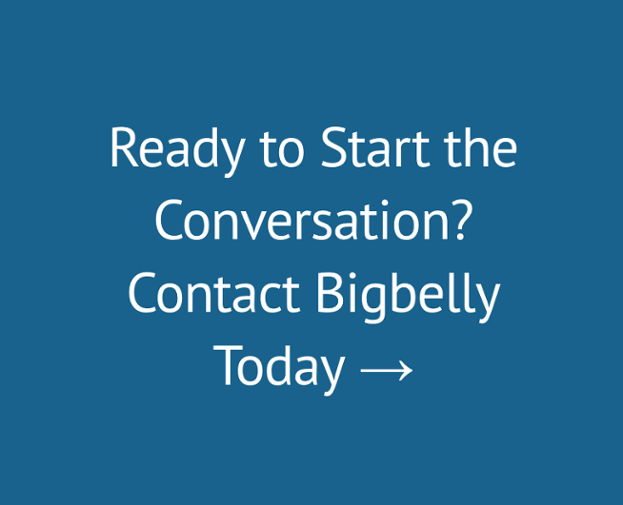 Efficiency with the Bigbelly system is only one metric of productivity with this smart system. Waste management collection teams measure success with efficiency (metric of the percent of stations that are collected when ready) and collection reduction. 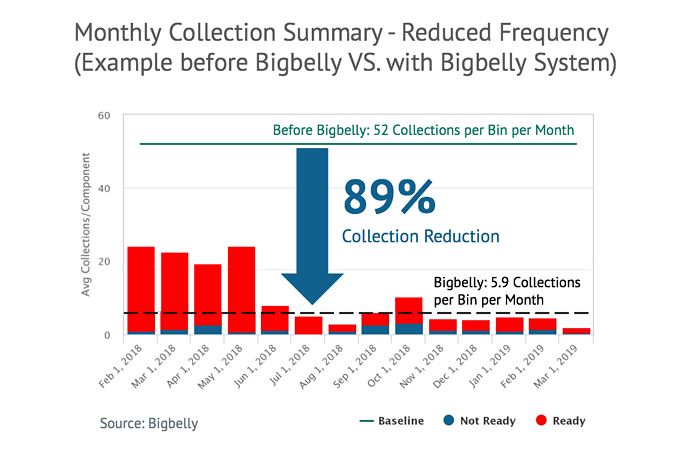 Many customers experience between 70-90% reduced collection frequency when using Bigbelly compared to traditional waste bins. Whether a fleet is comprised of High or Standard capacity units, all Bigbelly systems hold more than a traditional bin and have an impact on daily collection routine. Optimized routes can be created by only picking up bins that require collection and saving not-yet-full bins for a later route when they're full and ready! For the last three years, Bigbelly has analyzed system-wide data of meaningful sized or scaled Bigbelly deployments in communities across the world. One key benefit to communities using Bigbelly is the ability to measure and report on their progress of their key goals - whether that be gaining efficiencies, reducing collection frequency, increasing diversion rates, etc. Customers use Bigbelly smart waste and recycling system for many different reasons from more productive operations to consistent recycling infrastructure and everyone benefits from cleaner, less littered public spaces! We proudly promote our customers' focus on creating more livable, clean public spaces and more sustainable operations setting the bar for years to come. Congratulations to all Bigbelly customers for their dedication to improving public space waste management with greater efficiency and embracing public space waste diversion, and a special shout out to the communities who ranked in the Top 25 Lists of 2018!